Running, biking, hiking— just keep moving! I know we’re getting closer to race day when the event guide and corrals are posted! I worked on our race costumes this weekend while following coverage of the Star Wars Half Marathon: The Dark Side at Walt Disney World. By looking up our race waivers to get our bib numbers, we were able to see our corral placements. This may be the last time I can use my PR time from the 2014 Run for Sight for corral placement, but it was good enough to place me squarely in B corral. As I plan to run with Taylor, this doesn’t really mean anything, aside from making me smile, since last time I ran Tinker Bell, I was placed in C corral. Taylor, after running Race for Warmth only 10 days after starting training, managed to get placed in D corral— a huge improvement over F Corral, which is where we thought we would be if we hadn’t found a 10K we could run before the time deadline. His bib number shows us that he just barely missed being placed in C corral, so I’m guessing he will be in a higher corral for the Disneyland Half Marathon in September. Only 300 people in D corral had seed times faster than Taylor. Since Taylor is faster than me now and I was placed in B corral, our current plan is to start as close to the front of D corral as possible. I’m sure we’ll mix with C corral and B corral. 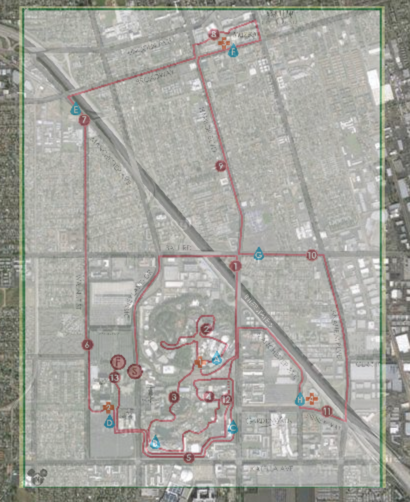 I was guessing the 2016 Tinker Bell Half Marathon course would have to differ from previous years because of the construction on the new Star Wars Land in Disneyland. With the publication of the Event Guide, we finally found out the course, and I’m pretty happy with it. 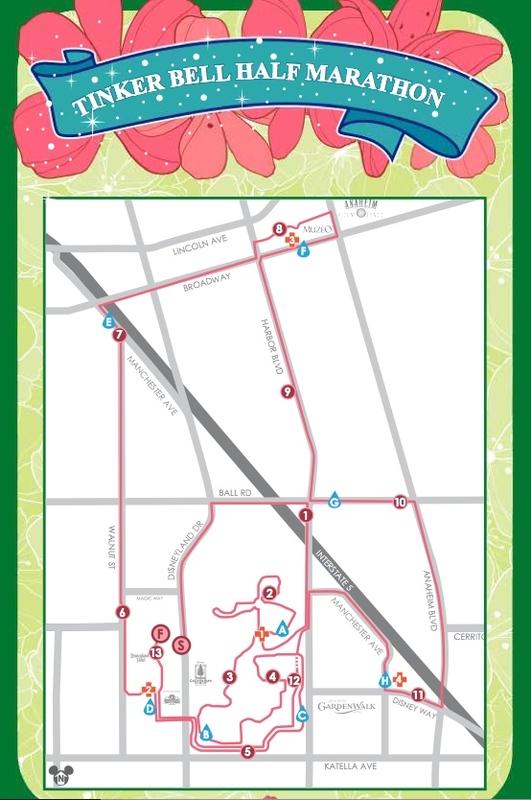 The official course map from the 2016 Tinker Bell Event Guide. I’m glad it differs so much from the Star Wars Half Marathon and it looks like we spend a good chunk of the race on Disney property. Taylor actually overlaid the course map onto another map to get a better feel for how the course goes through the parks. Taylor’s version gives a bit more detail. Next weekend, Taylor and I will go on our last long run (14 miles) before the race and teh following weekend I’ll be cheering Jason on as he runs the Eugene Marathon. Before you know it, Tinker Bell time! I really like Taylor’s map! It’s a much better way to visualize the course than the random squiggly lines from the official course maps. It looks like you’ll be in the entry plaza at miles 1.6, 2.8 and 4.2. I think that’s a record for a DL course. Plus we can catch you at mile 5.7 near the Disneyland Hotel (provided we hustle through Downtown Disney). And then hang out near mile 13 to chear on the finishers! So there’s a *chance* Kelly and I could see you four times on course, plus the start and finish… That’s quite a lot for a road race! I’m looking forward to chearing for you in a few weeks! Kallen, an online content specialist, began running in 2012. Rockin' and a-Rollin' all over the Emerald City! Braving the hills to cross the bridge! Check out more of my race stats on Athlinks.com.